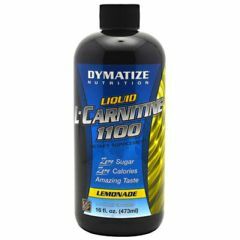 AllegroMedical.com presents The Dymatize Liquid L-Carnitine 1100 - Lemonade Amino Acid Supplement Gluten Free. Dymatize Liquid L-Carnitine gives you an amazing 31 servings per bottle while delivering 1,100 mg of L-Carnitine in each serving. The major function of L-Carnitine is to facilitate the transport and metabolism of long-chain fatty acids into the mitochondria for beta-oxidation and energy generation. L-Carnitine is known to aid in these positive effects: Enhanced endurance by inhibiting Lactic Acid build up in muscle cells. Increased fat metabolism by enabling a greater/faster transport of fat leading to increased fat oxidation, which may impact weight loss and/or endurance performance. Lowers cholesterol & triglyceride levels. This safe and effective water soluble nutrient is essential to the process of proper fat metabolism. Zero Sugar, Zero Calories, Amazing Taste. Naturally Flavored. Gluten Free. Water, L-Carnitine, Citric Acid, Natural Flavors, Potassium Sorbate, Sodium Benzoate, Sucralose, Calcium Pantothenate.